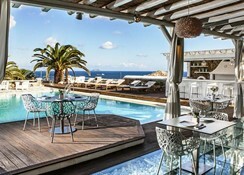 The Anemoessa Boutique Hotel has 26 design rooms and features an outdoor pool. 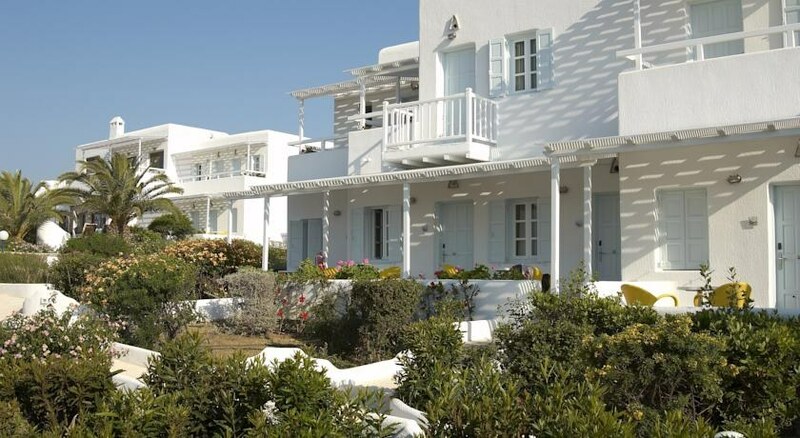 It is located less than a 10-minute stroll from Agia Anna Beach. The Anemoessa Boutique Hotel has recently undergone refurbishment and offers babysitting / child services, air conditioning and horse riding. Also available on site are luggage storage, multilingual staff and bicycle rental. The hotel also offers guests the convenience of Wi-Fi. Rooms feature refrigerators, high ceilings and slippers, and bathrooms come with complimentary toiletries and hair dryers. A hair dryer, a radio and a shower can be found in each room of the hotel. Connecting rooms are also available. Mykonos Island National Airport (JMK) is less than a 20-minute drive from the Anemoessa Boutique Hotel. Mykonos Windmills, Paradise Beach and the Archaeological Museum of Mykonos are less than a 20-minute drive from the hotel. The hotel is created in a traditional Cycladic architectural style with white-washed walls and smooth cubic shapes and offers warm hospitality and genuine personalised services. The hotel provides a lounge bar, restaurant, central safe box and private parking. The air-conditioned establishment comprises 26 guest rooms and features a lobby, TV and DVD lounge, cafï¿½, Internet access, room and laundry services and bicycle hire.